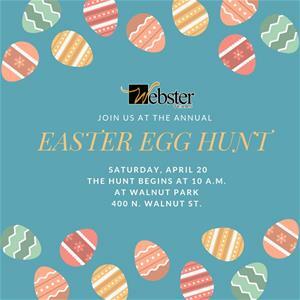 Peter Cottontail will be at Walnut Park on Saturday, April 20 for the annual City of Webster Easter Egg Hunt! The hunt begins promptly at 10 a.m. at Walnut Park, 400 N. Walnut St. It is recommended that the community arrive at the event early. This is a free event for children up to 10 years of age. There will also be a senior citizen division at the same time. Prizes will be awarded for special eggs. Following the hunt, Peter Cottontail will be at the park gazebo for children to visit with and take photos. Call 281.316.4137 for more information.